Coffee grows best with shade trees. Shade trees reduce stress in coffee. Avoid indiscriminate timber extraction for short-term gains. Maintain a two-tier shade canopy consisting of temporary and permanent shade trees like coconut, Ficus species, Albizzia species, jackfruit, and citrus, etc. At higher altitudes temporary shade trees may be phased out once the coffee is well-established. 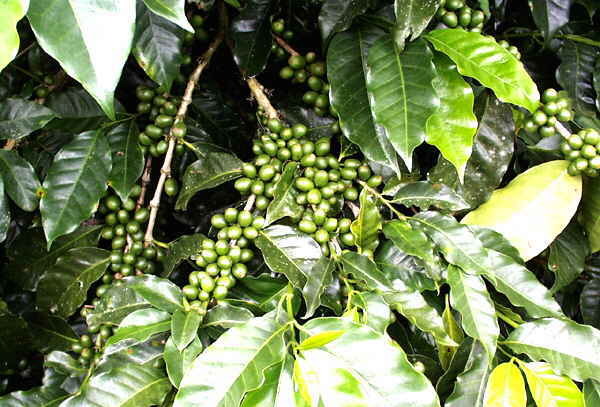 Regulate shade every year instead of once in 3-4 years to minimize damage to coffee bushes. Shade tree selection and management are important because better shade may increase the incidence of some important pests and diseases. To improve nitrogen content, organic matter, and to reduce hardness of the soil, plant leguminous crops alternately such as; Canavalia (CIAT Africa, 2003), Crotalaria, Tephrosia, cow pea, horse gram as green manure crops in young coffee fields. Uproot at early pod formation and leave plant residues on the soil to decompose slowly. Intercrops and green manure crops promote habitats for beneficial insects and suppress the weeds in young coffee fields. To generate income during pre-bearing stages of coffee, grow vegetables, ginger, yams, pineapple, and medicinal and aromatic plants as cash crops. Mulching using dried banana leaves and cut dried grass conserve soil moisture, protects soil from compaction, and reduces soil acidity. It appears that cooler, humid conditions of mulched soil reduce coffee thrips population, which thrive under hot and humid conditions. However, mulching may increase attack by leafminer because it provides favorable habitat to complete its lifecycle (PAN UK, 1998). Return coffee pulps and hulls as organic fertilizer in coffee fields. These are rich in nutrients. A 60 kg bag of coffee pulps/hulls contains: 1 kg N; 0.60 kg P; .09 kg K and other trace elements. The pulp resulting from processing contains: 1 kg N; 0.84 kg P; 2.25 kg K and trace elements (Coffee Research Institute, 2001). Fertilizer recommendations based on soil analysis provide the very best chance of getting the right amount of fertilizer without over or under fertilizing. Pruning is important practice to improve coffee production. Remove the unnecessary branches (excess, old, and dead branches) and undesirable shoots. Pruning regulates the height of the plants, facilitates harvesting and other field operations, and promotes better aeration and light penetration. This is best done before general flowering or after harvest. Coffee Research Center (Uganda), Coffee Research Foundation (Kenya), Cenicafe (Colombia), and USDA conducted researches on the ecology, biology, and parasitism rates of parasitoids on the control of coffee berry borer (CBB), an important coffee pest. The research focused on identifying factors affecting parasitism, such as rearing methods and ways of enhancing parasitism when released in coffee farms. In Uganda, CBB was low because Hyphothenemus coffeicola and Phymastichus coffea parasitism rates were high. In Africa, bethylid wasps were introduced but did not prove effective. In Colombia, nearly 10 million parasitoids have been released and more assessments are being made on P. coffea parasitism rates (CABI Bioscience, 2001). Kulkarni, V. (2002): Coffee, areca growers look to aromatic plants as intercrops. The Hindu Business Line. Bangalore, India. PAN UK. (1998): Growing coffee with IPM. Pest Management Notes No. 9. Pesticide Action Network. London, UK.